Hi Traders! Here is the Monthly Performance Summary Of My Strategies November 2018 of the trades taken with sRs Trend Rider 2.0, Forex Triple B 2.0, Forex Crystal Ball, Divergence University and FX Delta. November was an excellent trading month. sRs Trend Rider 2.0 is the best performer of this month with +12.52% profits, next we have FX Delta with +7.01% profits, Forex Triple B 2.0 with +5.15% profits, Divergence University with +4.2% profits (4weeks) and then we have Forex Crystal Ball with +3.84% profits (4weeks). This is definitely yet another good trading month for us. As you can see the results provided by my strategies in the month of November are simply amazing. These results can also be achieved by you or even better using my strategies, it is definitely possible! Most importantly I provide a wonderful opportunity to achieve it by giving you my systems completely free! You don’t need to use all the systems, you can choose the ones that matches your trading style. In EURNZD the price was moving higher this is when we got a conservative sell setup alert from sRs Trend Rider 2.0. We had a good uptrend line that has formed and we entered this trade with the breakout of this uptrend line and the price moved in our favor providing amazing returns. In EURAUD the price was moving higher this is when we got an aggressive sell setup alert from sRs Trend Rider 2.0. We had a good uptrend line that has formed and we entered this trade with the breakout of this uptrend line and the price moved in our favor providing excellent returns. In GBPAUD we got a sell alert from FX Delta. FX Delta indicated us the market direction is bearish and the HTF range is ok. We also got the confirmation of alpha pattern and the risk reward was also good. Hence we entered this trade and the price moved in our favor providing good returns. In JPN225 we got a sell alert from FX Delta. FX Delta indicated us the market direction is bearish, the HTF range is ok and the risk reward was good. Hence we entered this trade and the price moved in our favor providing nice returns. In EURNZD the price was moving higher this is when Forex Triple B 2.0 indicated that the price has entered the sell zone and there is no opposite divergence, in addition to this Triple B indicated us that the risk reward of this trade is also good. Hence we entered this trade and the price moved lower as expected providing fantastic profits. In AUDJPY the price was moving lower and Forex Triple B 2.0 indicated that the price has entered the buy zone. It also indicated us that there is no opposite divergence and the current timeframe divergence is ok. Hence we entered this trade and the price moved in our favor providing excellent profits. In GBPCAD we had a bearish momentum and the price has created lower lows. Whereas we had higher lows on the MACD forming a bullish divergence. Hence we got into this trade based on the bullish divergence principle and the price moved in our favor providing fantastic returns. In Gold we had a bearish momentum and the price has created lower lows. Whereas we had higher lows on the MACD forming a bullish divergence. Hence we got into this trade based on the bullish divergence principle and the price moved in our favor providing wonderful returns. In EURNZD we got a bullish alert and Forex Crystal Ball indicated us to look for buys. The price was below the channel and in addition to this we had a good downtrend line that has formed. Hence we entered this trade with the breakout of this downtrend line and the price moved in our favor providing amazing returns. In Gold we got a bearish alert and Forex Crystal Ball indicated us to look for sells. Crystal Ball had a reading which was above 50% and we also had a perfect uptrend line that has formed. We entered this trade with the breakout of this uptrend line and the price moved in our favor providing wonderful returns. The results provided by my strategies in the month of November was simply amazing! As you can see my team of traders did a great job by providing +32.76% profits this month, so a special appreciation to them! 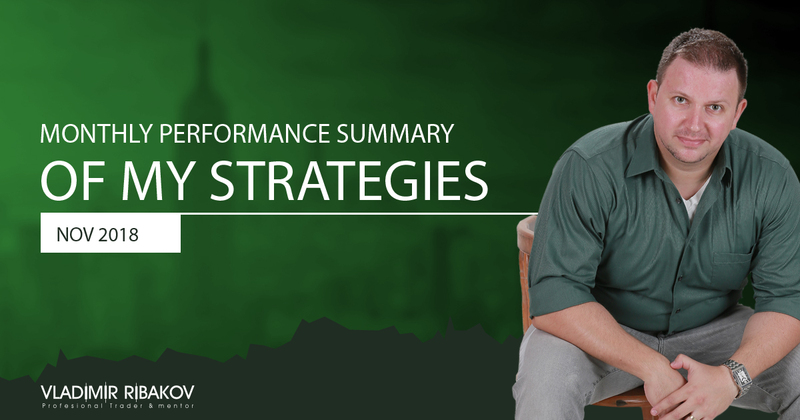 If you are following the performance summaries of the strategies every week, you could have easily noticed that sRs Trend Rider 2.0 which was at the top of the table for the past four weeks was at the bottom of the table in the fifth week. This means that few weeks back the market condition which was favorable for sRs Trend Rider 2.0 has changed and when the condition changes it might favor another strategy. This is why using more than one strategy is a good idea and can provide us wonderful results. Thank you Vlad for sharing this.